The date marking the end of prehistory is typically defined as the advent of the contemporary written historical record. The date consequently varies widely from region to region depending on the date when relevant records become a useful academic resource. For example, in Egypt it is generally accepted that prehistory ended around 3200 BCE, whereas in New Guinea the end of the prehistoric era is set much more recently, at around 1900 common era. In Europe the relatively well-documented classical cultures of Ancient Greece and Ancient Rome had neighbouring cultures, including the Celts and to a lesser extent the Etruscans, with little or no writing, and historians must decide how much weight to give to the often highly prejudiced accounts of these "prehistoric" cultures in Greek and Roman literature. The main source for prehistory is archaeology, but some scholars are beginning to make more use of evidence from the natural and social sciences. This view has been articulated by advocates of deep history. The primary researchers into human prehistory are archaeologists and physical anthropologists who use excavation, geologic and geographic surveys, and other scientific analysis to reveal and interpret the nature and behavior of pre-literate and non-literate peoples. Human population geneticists and historical linguists are also providing valuable insight for these questions. Cultural anthropologists help provide context for societal interactions, by which objects of human origin pass among people, allowing an analysis of any article that arises in a human prehistoric context. Therefore, data about prehistory is provided by a wide variety of natural and social sciences, such as paleontology, biology, archaeology, palynology, geology, archaeoastronomy, comparative linguistics, anthropology, molecular genetics and many others. The early part of the Palaeolithic is called the Lower Palaeolithic, which predates Homo sapiens, beginning with Homo habilis (and related species) and with the earliest stone tools, dated to around 2.5 million years ago. Evidence of control of fire by early humans during the Lower Palaeolithic Era is uncertain and has at best limited scholarly support. The most widely accepted claim is that H. erectus or H. ergaster made fires between 790,000 and 690,000 BP (before the present period) in a site at Bnot Ya'akov Bridge, Israel. The use of fire enabled early humans to cook food, provide warmth, and have a light source at night. Early Homo sapiens originated some 200,000 years ago, ushering in the Middle Palaeolithic. Anatomic changes indicating modern language capacity also arise during the Middle Palaeolithic. During the Middle Palaeolithic Era, there is the first definitive evidence of human use of fire. Sites in Zambia have charred bone and wood that have been dated to 61,000 BP. The systematic burial of the dead, music, early art, and the use of increasingly sophisticated multi-part tools are highlights of the Middle Paleolithic. 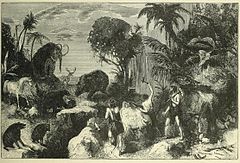 The Mesolithic period began at the end of the Pleistocene epoch, some 10,000 BP, and ended with the introduction of agriculture, the date of which varied by geographic region. In some areas, such as the Near East, agriculture was already underway by the end of the Pleistocene, and there the Mesolithic is short and poorly defined. In areas with limited glacial impact, the term " Epipalaeolithic" is sometimes preferred. "Neolithic" means "New Stone Age." Although there were several species of human beings during the Paleolithic, by the Neolithic only Homo sapiens sapiens remained. ( Homo floresiensis may have survived right up to the very dawn of the Neolithic, about 12,200 years ago.) This was a period of primitive technological and social development. It began about 10,200 BCE in some parts of the Middle East, and later in other parts of the world  and ended between 4,500 and 2,000 BCE. The Neolithic is a progression of behavioral and cultural characteristics and changes, including the use of wild and domestic crops and of domesticated animals. Early Neolithic farming was limited to a narrow range of plants, both wild and domesticated, which included einkorn wheat, millet and spelt, and the keeping of dogs, sheep and goats. 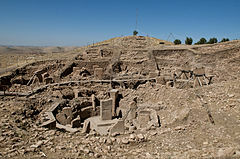 By about 6,900–6,400 BCE, it included domesticated cattle and pigs, the establishment of permanently or seasonally inhabited settlements, and the use of pottery. The Neolithic period saw the development of early villages, agriculture, animal domestication, tools and the onset of the earliest recorded incidents of warfare. The Neolithic era commenced with the beginning of farming, which produced the " Neolithic Revolution". It ended when metal tools became widespread (in the Copper Age or Bronze Age; or, in some geographical regions, in the Iron Age).The term Neolithic is commonly used in the Old World, as its application to cultures in the Americas and Oceania that did not fully develop metal-working technology raises problems. An archaeological site in Serbia contains the oldest securely dated evidence of copper making at high temperature, from 7,500 years ago. The find in June 2010 extends the known record of copper smelting by about 800 years, and suggests that copper smelting may have been invented in separate parts of Asia and Europe at that time rather than spreading from a single source. The emergence of metallurgy may have occurred first in the Fertile Crescent, where it gave rise to the Bronze Age in the 4th millennium BCE (the traditional view), though finds from the Vinča culture in Europe have now been securely dated to slightly earlier than those of the Fertile Crescent. Timna Valley contains evidence of copper mining 9,000 to 7,000 years ago. The process of transition from Neolithic to Chalcolithic in the Middle East is characterized in archaeological stone tool assemblages by a decline in high quality raw material procurement and use. North Africa and the Nile Valley imported its iron technology from the Near East and followed the Near Eastern course of Bronze Age and Iron Age development. However the Iron Age and Bronze Age occurred simultaneously in much of Africa. The Iron Age is not part of prehistory for all civilizations who had introduced written records during the Bronze Age. 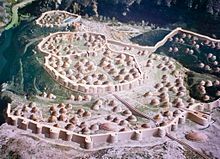 Most remaining civilizations did so during the Iron Age, often through conquest by the empires, which continued to expand during this period. For example, in most of Europe conquest by the Roman Empire means that the term Iron Age is replaced by "Roman", " Gallo-Roman" and similar terms after the conquest. In archaeology, the Iron Age refers to the advent of ferrous metallurgy. The adoption of iron coincided with other changes in some past cultures, often including more sophisticated agricultural practices, religious beliefs and artistic styles, which makes the archaeological Iron Age coincide with the " Axial Age" in the history of philosophy. Although iron ore is common, the metalworking techniques necessary to use iron are very different from those needed for the metal used earlier, and iron was slow-spreading and for long mainly used for weapons, while bronze remained typical for tools, as well as art. All dates are approximate and conjectural, obtained through research in the fields of anthropology, archaeology, genetics, geology, or linguistics. They are all subject to revision due to new discoveries or improved calculations. BP stands for " Before Present (1950)." BCE stands for Before Common Era". c. 200,000 BP – Anatomically modern humans ( Homo sapiens sapiens) appear in Africa, one of whose characteristics is a lack of significant body hair compared to other primates. See e.g. Omo remains. c. 32,000 BP / 30,000 BCE – Beginnings of Aurignacian culture, exemplified by the cave paintings (" parietal art") of Chauvet Cave in France. c. 26,500 BP – Last Glacial Maximum (LGM). Subsequently, the ice melts and the glaciers retreat again ( Late Glacial Maximum). 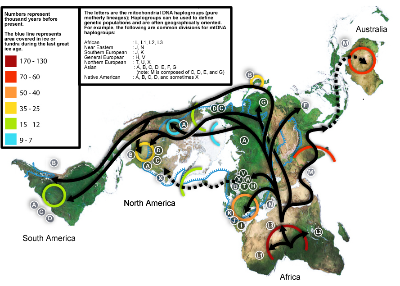 During this latter period human beings return to Western Europe (see Magdalenian culture) and enter North America from Eastern Siberia for the first time (see Paleo-Indians, pre-Clovis culture and Settlement of the Americas). c. 3,300 BCE – Approximate date of death of " Ötzi the Iceman", found preserved in ice in the Ötztal Alps in 1991. A copper-bladed axe, which is a characteristic technology of this era, was found with the corpse. ^ Connah, Graham (2007-05-11). "Historical Archaeology in Africa: An Appropriate Concept?". African Archaeological Review. 24 (1–2): 35–40. doi: 10.1007/s10437-007-9014-9. ISSN 0263-0338. ^ Eddy, Matthew Daniel (2011). "The Line of Reason: Hugh Blair, Spatiality and the Progressive Structure of Language". Notes and Records of the Royal Society. 65: 9–24. doi: 10.1098/rsnr.2010.0098. ^ Eddy, Matthew Daniel (2011). "The Prehistoric Mind as a Historical Artefact". Notes and Records of the Royal Society. 65: 1–8. doi: 10.1098/rsnr.2010.0097. ^ Earle, Timothy (1989). "Chiefdoms". Current Anthropology. 30 (1): 84–88. doi: 10.1086/203717. JSTOR 2743311. ^ Toups, M.A. ; Kitchen, A.; Light, J.E. ; Reed, D. L. (September 2010). "Origin of Clothing Lice Indicates Early Clothing Use by Anatomically Modern Humans in Africa". Molecular Biology and Evolution. 28 (1): 29–32. doi: 10.1093/molbev/msq234. PMC 3002236. PMID 20823373.